We welcomed the Leadership Franklin Class of 2019 on August 29 at Eastern Flank Park. Day Chairs Kristine Tallent and Torrey Barnhill led the group in discussions about the upcoming program year, what to expect, class projects, and the impact of LF in the community. That evening over 80 alumni, class members and guests welcomed the new class at a reception and dinner at the Vanderbilt Legends Club. Early the next morning, the group met at Deer Run Camp in Thompson’s Station for great fellowship and team building. Assistant Commissioner, Trish Holliday, facilitated the morning session and closed with a memorable example of leadership. Special thanks to Pinnacle Financial Partners and LFA Vickie Manning for their continued support of our opening retreat. History was made at this year’s History Day Program. Rick Warwick began the day with an overview of the history of Franklin. During the day, we experienced Eastern Flank Battlefield, the Carter House, time under the tree with Jimmy Gentry, McLemore House, and downtown Franklin. At the close of the day, the class participated in a community meal on Natchez Street. Day Chairs Kevin Riggs and Cyril Stewart the discussion of Franklin’s history to the present. Judy Hayes is the 2018 recipient of the Caroline J. Cross Award for Leadership Franklin. The award was presented during the organization’s August 29 opening celebration for the upcoming class year. Hayes, a Franklin High School alumna, graduated from Lipscomb University with a degree in education and taught an extended time at Bethesda Elementary and Grassland Elementary. A few years later, Hayes and her husband Jim were co-owners in the former WIZO radio station that later became WAKM. Hayes assisted in selling advertisements, and it was then she cultivated a passion for her community, Williamson County. She is no stranger to community service in Williamson County. Hayes’ 28-year service as commissioner is highlighted with numerous influences on county life, such as the Broad Base Tax Relief for the Elderly program and Agricultural Exposition Park. She was also a member of the Special Courthouse Committee that oversaw construction of a new judicial center on 4th Avenue while preserving the historic building just a few blocks away. She retired from the commission in 2014. Hayes’ influence goes well beyond local government with leading roles in consolidation of Williamson County’s local chambers of commerce – today’s Williamson, Inc. She is also a founding member of the renowned Williamson County Fair, creating the Historic Village exhibit that showcases local farming and rural communities. Hayes holds the honor as Williamson County Convention and Visitors Bureau’s first chairman of the board. An advocate of recycling, Hayes continues today to serve on the county’s Municipal Solid Waste Board and volunteer on Household Hazardous Waste Collection Day. She is a member of the Heritage Foundation and Williamson County Historical Association. include leadership that motivates and inspires other individuals along with traits of creativity, character, dedication, and community service. Each year’s class submits nominations and selects an individual who makes a true impact in the community. Julian Bibb, Leadership Franklin Board Chair, with Judy Hayes, 2018 Caroline J. Cross Award Recipient. Lacie Simonton, The Parkes Companies, Inc. Leadership Franklin's class of 2018 showcase their project work during this year's graduation ceremony. Leadership Franklin has awarded its $1,500 scholarship to recent Franklin High School graduate Priscilla Kirkpatrick. She plans to attend Samford University this upcoming fall. Kirkpatrick is an active Franklin High School honor student. She is involved in theatre and is a member of the tennis and swimming teams. She has volunteered extensively outside of school at the Veterans Hospital, Williamson County Animal Control, and Grace Community Church. Kirkpatrick has attended Girls State and is a past Governor of Volunteer Girls State. She is also a recent participant of the Young Women’s Institute at Indiana University’s Kelley School of Business. Leadership Franklin held graduation ceremonies for its twenty-second class at Franklin City Hall on Wednesday, May 9. Graduates are executives and senior community leaders selected to represent a cross-section of Franklin and Williamson County. The Kentucky native and insurance professional has been an active Franklin citizen since arriving in 1978. He is the founding member of Mercy Children’s Clinic, Franklin City Club, and The Hundred Club of Franklin. Drury is a member of the Williamson, Inc., and past board member of numerous organizations such as the Downtown Franklin Association, Williamson Medical Foundation, and Heritage Foundation. In 2001, Drury founded A Vintage Affair (AVA), a nonprofit organization that leverages boutique wine and spirits to raise funds for local charities in Williamson County. Over $1.5 million has been given to organizations benefiting causes relative to local women and children. AVA has contributed $600,000.00 to equip the Neonatal Intensive Care Unit at Williamson Medical Center and the new adjoining Monroe Carell, Jr. Children’s Hospital Vanderbilt since 2005. Lisa Clayton, City of Franklin Parks Director, has joined the Board of Directors for Leadership Franklin. Clayton graduated from Leadership Franklin in 2014. Clayton was named Franklin’s Parks Department Director in 2002 and is responsible for the City’s award-winning leadership, administration, and management. She is a recipient of Tennessee Recreation and Parks Association’s highest award, the Fellow Award, that recognizes members for their outstanding contributions to the recreation field throughout their career. ABOVE: Ernie Reynolds, Leadership Franklin class of ’16-17, Eric Stuckey, ’09-10, Paula Harris, ’10-11, Mark Hilty, ’17-18, Robert Blair, ’99-00. The impact of the Leadership Franklin program is storied and far reaching. Jewels of the Franklin landscape including the brand-new Pocket Park, Bicentennial Park, the McLemore House Historic Audio Tour, and the Driving Tour from the Carter House to the Carnton Plantation. all are program projects of Leadership Franklin classes. An award-winning children’s book, Where Are Bucky and Bonnie? was published and Mimi’s Room – a space of comfort for little ones – at the Williamson County Juvenile Court – was renovated showing the bandwidth of the program’s impact. Graduates of the Leadership Franklin program humbly continue to serve the community. They are a network of servant leaders lending their expertise and sweat equity throughout Franklin and Williamson County including the areas of historic preservation, elected government positions, non-profit boards, in churches, in schools, and answering emerging quality of life issues such as affordable housing. And while the impact of the program is deep and wide in its reach, the more than 400 graduates of the program relate to each other as though family, seeking each other out for advice, help, or simply to check in with each other. This group is a force of folks leaning in on their talents to keep Franklin great. A friendly family of over 400 members. That’s a big family tree with an exponential amount of connections brought together by a calling to serve. The community of Franklin is sought after, internationally, as a place to live and to work. Growth in residents and businesses relocating to Franklin is exponential. With each new family that arrives, each corporation that changes their address to a Franklin zip code, or everny new small business putting out its shingle there, is a sense of belonging as they stroll past Franklin Theatre on their way to Puckett’s for a meal or descend on Cool Springs to shop. But how does someone begin to bring their talents and expertise to help meet the needs of the community? How can someone get involved in service to have an impact on the Franklin community if you are in a career or life stage transition? What does it take? Who do I need to know? When can I begin to help my neighbor? As a Leadership Franklin alum myself (Class of ’13-14), I knew reaching out to the program’s Executive Director Paula Harris ’10-11 and Associate Executive Director Debbie Henry, ’10-11 would help answer these questions. We invited members of this Leadership Franklin “family” to talk about their experiences in the program and how to get engaged in opportunities of community impact. Leadership Franklin Executive Director Paula Harris ’10-11 and Associate Executive Director Debbie Henry ’10-11. Meeting at City Hall in downtown Franklin, I had the pleasure of talking with City Administrator Eric Stuckey ,’09-10, Ernie Reynolds, ’16-17, CEO of Outdoor Classic Structures and a native of this area, Robert Blair, ‘’99-00, born and raised in Franklin consummate community leader whose service includes over 15 years on the Franklin Special School District School Board, Mark Hilty, ’17-18, Franklin assistant city administrator, and Paula Harris, ’10-11, current Leadership Franklin Executive Director whose Franklin roots reach back to the Pioneer days. The room was buzzing as soon as we assembled. I realized that I would not have met these folks were it not for the program. We began by talking about how their favorite program day influenced their choices of service. I am ahead of myself just a bit. Some important background information is necessary to fully understand the value of this program and the ease with which anyone can begin to serve in this community. 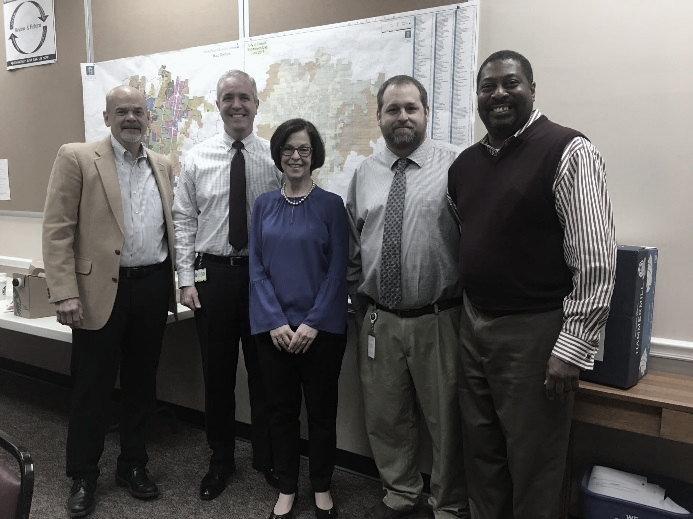 For more than 20 years, Leadership Franklin has provided for a cohort of 20 members an almost year-long program aimed to provide class members with knowledge, network connections, and resources to bring forth new ideas to serve the citizens of Franklin and Williamson County. Created by a team of Franklin community leaders including long-time resident and first program Executive Director Caroline Cross, the program seeks to grow a citizenry of service-oriented people. The monthly day-long session topics are: history, government, business, law enforcement, media, education, quality of life and land resources. Land resources is a brand-new program day this year. This exposure to Franklin and the county help groups within the class create a project that supports or improves some aspect of the community. Robert Blair cited Education Day as one of the most meaningful in part because he was a teacher, but that day he learned about all the educational opportunities offered in the area. And although he graduated years ago from the program, he joins the current class for program days such as Education to continue to stay current in his role on the FSSD School Board and as an active citizen. Mark Hilty and Ernie Reynolds were most touched in the areas of serving Franklin’s children. Moving to the topic of connecting to the community to serve, everyone at the table suggested applying to Leadership Franklin by May 11, 2018 for next year’s class: www.leadershipfranklin.com/application/. “I have lifelong friends because of Leadership Franklin’, Debbie Henry says. ‘If you live in Franklin or do business in this community, we would love to hear from you. And if you are a high school student who wants to learn about leadership in your community, we have the Youth Leadership Franklin program too: www.youthleadershipfranklin.org/. And if time doesn’t permit going through the Leadership Franklin program, what can someone do to get involved in the community? “Oh goodness, says Robert Blair, just call me. I would be very happy to talk to you and introduce you to anyone in town that could be of help to you. I’ve done that for years. That’s what we all are supposed to do, welcome anyone in who says, “how can I help?”. All gathered suggested that before you commit to an organization spend some time learning about all the needs of the community and the organizations already providing services in those areas. The Williamson Herald and Franklin Home Page were held up as great resources as well as the programming of Franklin Tomorrow with its Breakfast with the Mayors and Frank Talks events for folks looking for connections to serve. Joining the Rotary was also seen as an option for people transitioning to retirement or a career change. Leadership Franklin is accepting applications for the Class of 2018-2019 through May 11. Deb Enright, Ed.D., Leadership Franklin class of 2013-14, is committed to helping folks find ways to bring their talents to nonprofit organizations just waiting to meet them. Leadership Franklin has announced that applications are now being accepted for its twenty-third class, 2018-2019. Applications may be downloaded here. Completed applications are due on or before May 11, 2018. Questions regarding the application process may be directed to Paula Harris, Executive Director, at 615.491.6536 (paula.harris@bargedesign.com) or Debbie Henry, Associate Director, at 615.628.0264 (dhenry@tmagroup.org). Leadership Franklin is a non-profit community leadership organization dedicated to educating, informing and empowering leaders to improve the quality of life in Franklin and Williamson County. Participants meet once per month for nine months, for a series of classes aimed at presenting and analyzing a particularly important segment of the community. Classes focus on the areas of history, government, business, law enforcement, media, education and quality of life. The class begins with an opening day and retreat in August. Each year’s class is divided into four groups who develop a class project to be presented on graduation day. Recent class projects include the Lake Dock at Harlinsdale Farm, a pocket park on Old Liberty Pike, a partnership between the Williamson County Sheriff’s Drug Task Force to present Get RAD (aka Get Real Against Drugs) informational sessions, and a video presentation of local visionaries chronicling the business impact of well-known local leaders in Franklin. High school seniors and current college students who live in Williamson County are encouraged to apply for the scholarship to be awarded by Leadership Franklin. The non-profit organization will award one $1,500 scholarship to a student who meets the scholarship criteria. Applicants must have a minimum 3.25 cumulative grade point average to be considered. A copy of the student’s transcript and a 500-word essay are part of the application requirement. Scholarships are awarded based on a scoring process of scholarship application points: a combination of grade point average, school extra-curricular activities including sports and community outreach, and strength of writing/quality of essay. All students are encouraged to apply. Applications are due March 2, 2018. Applications may be obtained here. Mary Mills has been named the recipient of this year’s Caroline J. Cross Award for Leadership Franklin. Mills, a lifelong Franklin resident, graduated from Franklin High School, and then headed for Tennessee State University where she earned an Administrative degree. She spent 39 years as a secretary at Johnson Elementary and as Principal at Franklin Middle School. Mills once again served her community as Williamson County Commissioner for 17 years in the 11th district, after retiring from the school system. She is an active member of the African American Heritage Society and has been affiliated with the Williamson County Chamber of Commerce, Williamson Medical Center, Community Childcare, and the Williamson County Health Council. The Caroline J. Cross Award was established to honor Mrs. Cross (Founding Executive Director) and create an ongoing award that identifies a leader in our community who exemplifies the values and lessons of Leadership Franklin. Criteria for nomination include leadership that motivates and inspires other individuals along with traits of creativity, character, dedication, and community service. Each year’s class submits nominations and selects an individual who makes a true impact in the community. Leadership Franklin's class of 2017 showcase their project work during this year's graduation ceremony. Leadership Franklin has awarded its $1,500 scholarship to recent Independence High School 2017 graduate Ashley Haylett. Haylett plans to attend the University of Tennessee, Knoxville this coming fall and will study courses to pursue a career as an animal nutritionist. Haylett is an active student at Independence with leadership roles in clubs like Young Rotarian Interact Club and Girls Cotillion, as Student Ambassador and a student council representative. She volunteers outside of school extensively with both Williamson County and Tennessee 4-H programs, leading significant projects that mentor and develop teams. Haylett currently serves as the Tennessee Central Region All-Star Chief, as well as the Tennessee 4-H State Council Senior Representative. The Junior Girl Scout Troop Leader has also volunteered with South Williamson Association and Special Olympic youth basketball leagues, GraceWorks Ministries, Inc., and Tennessee Baptist Children’s Home. Scholarship applicants must have a minimum 3.0 cumulative grade point average to be considered. A copy of the student’s transcript and a 500-word essay are part of the application requirement. The contribution is awarded based on a combination of scholarship application points, community involvement, and quality of essay. United Way of Williamson County’s board of directors recently announced the recipients of more than $2 million in 2017-2018 program grants from the organization’s Community Care Fund. The grants ranging from $347,000 to STARS, which serves students in Middle Tennessee with programs addressing violence, substance abuse and other issues; to $5,000 for Gentry’s Education Center at the Storefront, which provides tutoring and enrichment and other education programs. The grants are the culmination of a months-long allocations process with more than 60 community volunteers serving on Citizens Review Panels. The goal of this process, which includes in-depth vetting of each applicant program’s administration, finances and effectiveness, is to ensure donor resources create the strongest impact on the individuals who comprise Williamson County and on the community as a whole. This year, volunteers allocated the most funding for Health-related programs at $1,381,911, or 69 percent of the total funds. This investment supports the community’s most vulnerable, providing access to health care, therapies, in-home assistance and supports needed to improve wellbeing and safety. Education programs received $389,536 – 19 percent of the total fund – to remove barriers to learning and prepare students for successful, independent and productive futures. Income-related programs help community members build more stable lives through job skills training and additional resources to achieve and maintain self-sufficiency. This year, volunteers allocated $242,000, or 12 percent of the total fund, to reduce the burdens of financial need. With each of these investments, United Way of Williamson County’s Community Care Fund is investing in long-term, sustainable change for the community’s collective well-being. To view the details of this year’s community investments, visit uwwc.org/communityinvestments/. Leadership Franklin is pleased to announce its class of 2017-18. A ribbon-cutting was held this week for a new neighborhood park at 204 Old Liberty Pike in Franklin. Leadership Franklin Class of 2017 members, Williamson Inc., the city of Franklin Parks Department, Aldermen Margaret Martin, 4th Ward, and Alderman at Large Brandy Blanton and community leaders attended the event. Members of Leadership Franklin’s 2017 class worked with the city of Franklin to create the park in hopes to improve livability in the neighborhood by giving residents a place to sit, talk and enjoy the green space around them. Franklin Synergy Bank sponsored benches for the park. After the land was flooded in 2010, it was turned over to the city of Franklin with the thought that the land lying in the floodplain could never be built on. “We wanted to partner with city parks to create a neighboring park for this area,” said Travis Dumke, one of the project members. “With it being in a floodplain, we had to figure out how to make this work. The city was looking to identify a usage of the land, and members of Leadership Franklin worked with city staff to design a peaceful space with benches and landscaping for the families nearby to walk to and enjoy. Group members that participated in this project included Denise Andre, Williamson County General Sessions Court Judge; Travis Dumke, Franklin Synergy Bank; Adam Hicks, Skanska, USA; Tim Stillings, NCR Inc.;and Franklin Special School District school board member Amy Diaz-Barriga, city of Franklin. “We took the opportunity to utilize this property to bring something good to the community that they could use and enjoy,” said Hicks. Phase two of the project is set to include picnic tables and additional landscaping and trees that will border the property line. “Our group could not have completed the project without the help of Blake Shelton Lawncare & Landscaping, who was contracted to complete the park,” Dumke said. Leadership Franklin recently announced its 2016 scholarship recipients, Madison Ovies and Valerie Romanko, during the organization’s Twentieth Anniversary Celebration on April 7. Madison Ovies is a May 2013 Franklin High School graduate and a current student at West Virginia Wesleyan College (WVWC) in Buckhannon, West Virginia. Madison, a Girl Scout, co-founded her alma mater’s Buddies Club that mentors students with special needs. She has also volunteered with Habitat for Humanity and Franklin Girls Cotillion. Madison is now a member of the Alpha Delta Pi Sorority where she has served in various positions and co-founded the college’s WVWC Buddies program that pairs students with local elementary students. Valerie Romanko will graduate from Fred J. Page High School in May 2016. Valerie is actively involved in the school’s Health Occupations Students of America (HOSA) chapter, YMCA Model United Nations, and United Way. She is a graduate of Youth Leadership Franklin and has participated in such programs as the Governor’s School for the Scientific Exploration of Tennessee Heritage and Vanderbilt University’s Summer Academy. Valerie plans to attend East Tennessee State University in Johnson City, Tennessee, after graduation. High school seniors and current college students who live in Williamson County were encouraged to apply for the scholarship awarded by Leadership Franklin. Scholarships are awarded annually based on a combination of scholarship application points, community involvement, and quality of essay. Leadership Franklin is a non-profit organization to develop leadership and community engagement and further a vision for Franklin and Williamson County. Leadership Franklin began its twenty-first year on August 29, 2016 and announced Dr. Joseph Willoughby as this year’s recipient of the Caroline J. Cross Award. Dr. Willoughby moved to Franklin in 1960 after service in the United States Navy. Over the last 55 years, while practicing medicine in Franklin, Willoughby has supported various organizations such as The Heritage Foundation, Carnton Plantation, and the Franklin Noon Rotary Club. His strong belief in education led him to co-found Harpeth Academy (now Battle Ground Academy Lower Campus) and serve as trustee, board chairman, and benefactor. Willoughby is credited among other physicians who assisted in making Claiborne Hughes Nursing Home and Harpeth Terrace Nursing Home, now Grace Healthcare, a reality. In 2016, Williamson County Mayor Rogers Anderson proclaimed March 19 on Dr. Joseph “Joe” Willoughby Day. (L-R): Williamson County Mayor and Leadership Franklin Alumnus Rogers Anderson, First Inaugural Youth Leadership Franklin (YLF) Scholarship Recipient Julia Vesly, YLF Board members Tim Ledman and Will Powell. Youth Leadership Franklin is pleased to announce the first annual scholarship recipient, Julia Vesly. Julia will enter Tennessee Tech University in the fall of 2016, majoring in Human Ecology — Food, Nutrition and Dietetics. Youth Leadership Franklin is a non-profit leadership organization founded in 1998 as a class project from the adult Leadership Franklin program and was funded in 2015-16 through sponsorships provided by Williamson Medical Center, Stites & Harbison, Franklin Synergy Bank, First Tennessee Foundation and MTEMC Customers Care Program. Leadership Franklin is pleased to announce its twenty-first class. Founded in 1996 to develop leaders in Franklin and Williamson County, Leadership Franklin endeavors to provide class members with knowledge, network connections, and resources to bring new ideas to the table for the community. Each class day is focused on presenting and analyzing a particularly important segment of the city, including area history, government, business, law enforcement, media, education, and quality of life. Class members are grouped, and each group produces a leadership project for the year that is focused on improving some aspect of the community. Adam Hicks, Skanska USA Inc.